Imphal, January 19, 2018: Two Manipur riders who bagged six medals in the North East Equestrian Meet held at Dribugarh in Assam last week was felicitated yesterday by the members of Manipur Equestrian Association in a celebration held at Manipur Pony Breeding farm, Lamphel, Imphal West. Mongjam Vivekananda won silver in the Show Jumping Open Seniors and bronze in Show Jumping Fault and Out category. 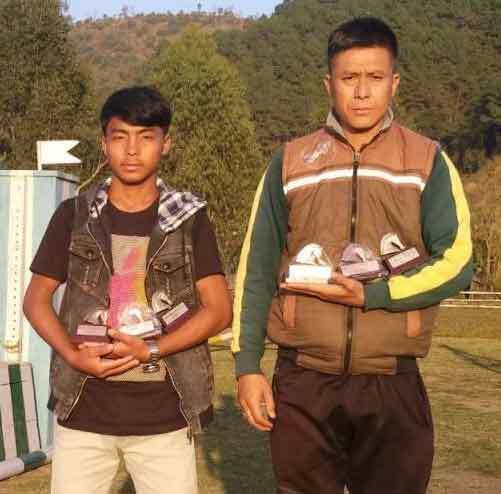 While in the junior category Umesh Gurung won silver in the Show Jumping Normal category and three bronze medals in Hacks Children, Show Jumping Open Junior and Show Jumping Fall and Out.